Age Group: As Per Req. 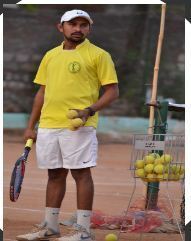 The Company provides tennis coaching on its genuine red clay courts, as per individual requirement from beginner to professional. Also provides accommodation for players and groups/families wanting to stay and play. Also arranges local tourism etc. Tennis courts with flood lights were developed in the year 2002. There are two asphalt base tennis courts and two up – grated asphalt courts of international standards. All four courts are illuminated with flood lights. The courts are cushioned with Pro-Deco. More than 50 students undergo coaching at the Tennis courts. Winning Edge follows “Play & Stay coaching protocol designed and promoted by International Tennis Federation. This grip is used mainly for the forehand drive. The palm lies more underneath the handle. This grip makes it easier to hit balls that are above waist height, and leads to aggressive forehand shots. Mini Tennis is the ideal way for your child to start learning tennis and ensure they receive the right ingredients to advance their ability throughout their early years. The structured progressions ensure that players are guided through the levels appropriately whilst gaining confidence to embrace new challenges as they grow. Tennis facility provides coaching for different levels of players. It is backed by highly motivated staff which has resulted in full capacity of training time and play time. There is a plan to add more courts in near future.